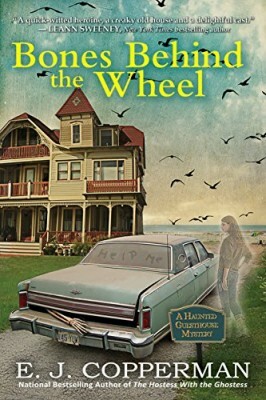 Details at the end of this post on how to enter to win a copy of Bones Behind the Wheel, and a link to purchase it from Amazon, and an indie bookstore where a portion of the sale goes to help support KRL. When a bucket of drywall compound landed on Alison Kerby’s head, it activated her family’s matrilineal ability to see and communicate with ghosts. After a rocky period of adjustment, Alison has successfully negotiated an arrangement with her two live-in ghosts to perform for scheduled appearances at her Harbor Haven Haunted Guesthouse. Resident ghosts Maxie Malone and Paul Harrison tend to get bored though, which is why Maxie is insisting on redecorating Alison’s kitchen while Paul is more than anxious to take on another private detective agency client. While Maxie is distracted by her plans to renovate Alison’s guesthouse without regard to functionality, practicality, or budget, Paul sees an investigative opportunity right on their doorstep. Or more accurately their beachfront, as New Jersey’s project to repair beach damage by moving around sand has unearthed a vintage Lincoln Continental, which is remarkable not just for its ability to disappear and reappear the next morning, but by the body stashed inside. Despite having caved into Paul’s insistence on earning her own private investigator license, Alison declares that she wants nothing to do with the mystery of the corpse in the sand (she basically doesn’t feel like it). Instead, it’s her new husband Josh who eagerly enlists as Paul’s apprentice investigator, tracking down missing persons, pirate treasure, and uncovered bullet casings. Whatever concerns Alison had about Josh’s being introduced to her spectral world are completely put aside – and replaced with new ones – as while still unable to see or hear ghosts, he is delighted to learn that he can text them. The completely put upon Detective Lieutenant Anita McElone is still not thrilled with the knowledge that ghosts exists, but she really saves her sarcasm and barbs for Alison. For no matter how many times Alison declares that she’s not a part of the investigation, she somehow always finds herself up to her armpits in mayhem and corpses. This continues to be a mystery series that delights in acknowledging and subverting amateur mystery tropes, which guarantees for a genuinely hilarious and surprising novel. Just when readers think they have the puzzle solved, the unexpected occurs, which should delight even the most jaded and experienced mystery fans. The real reason this series has become so beloved though, are the characters and the witty dialogue, a trademark of the novels by Copperman (AKA Jeff Cohen). As hilarious and relatable the exchanges between Alison and her thirteen daughter may be, just as rewarding has been the often tempestuous relationship between Alison and the eternally young Maxie. That the ghosts are as vulnerable and sympathetic as the “real” characters is a testament to the writing, which has allowed them to grow along with the living. The eminently satisfying conclusion promises a new avenue of adventures for the Haunted Guesthouse family, and the next installment can’t come soon enough. To enter to win a copy of Bones Behind the Wheel, simply email KRL at krlcontests@gmail[dot]com by replacing the [dot] with a period, and with the subject line “wheel,” or comment on this article. A winner will be chosen February 23, 2019. U.S. residents only. If entering via email please include your mailing address (so if you win we can get the book sent right out to you), and if via comment please include your email address. You can read our privacy statement here if you like. Check out other mystery articles, reviews, book giveaways & mystery short stories in our mystery section. And join our mystery Facebook group to keep up with everything mystery we post, and have a chance at some extra giveaways. Also listen to our new mystery podcast where mystery short stories and first chapters are read by actors! They are also available on iTunes and Google Play. An intriguing and unique novel which I would enjoy greatly. Thanks for this feature and giveaway. I need to catch up on this series! E. J. always supplies a wonderful plot and a very entertaining read. I am way behind in this series but glad to see new books being issued regularly. This author happens to be one of the most talented of the cozy mystery genre. He has created characters who are interesting, entertaining and smart (or smart mouthed). Good series, good author, which makes this a most wonderful opportunity. This series is on my TBR list and this review makes me want to read them even more! Thanks for the great review. I love the series and own four of the titles. Since my local library is slow to carry this authors books I really REALLY would love to be the happy winner. Great series! Can’t wait to read “Bones Behind The Wheel”. I really enjoy this series, both the live and ghost characters.